Is it me, or did Valentine’s Day seem to just sneak up on us? It’s NEXT WEEK! So I’ve whipped up a few quick and easy – yet super fun – ideas for you. 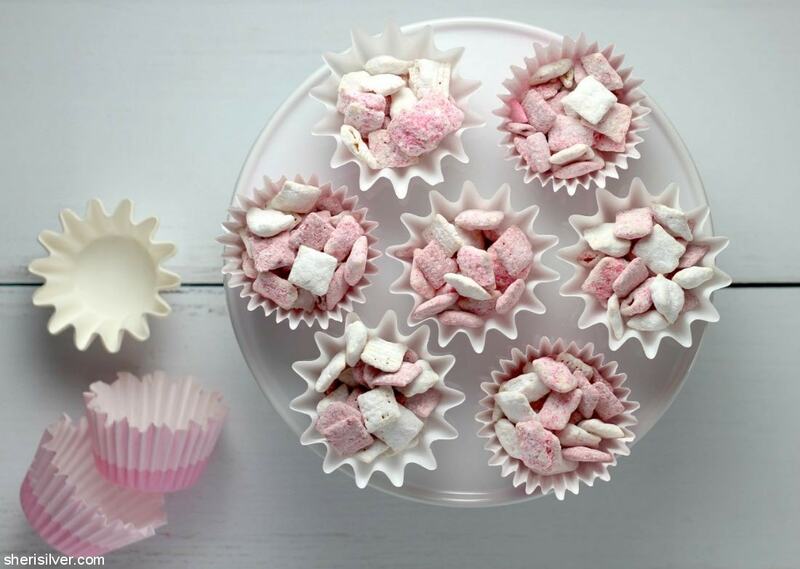 And can you believe I’ve never made a Valentine’s-themed batch of Muddy Buddies till now? I took a cue from a classic holiday treat – chocolate-dipped strawberries – for the flavors here, and I think it came out great. The red batch is coated in strawberry sugar, made from ground freeze-dried strawberries. The berry flavor really comes through and is a nice complement to all that sugar and chocolate. I went extra with the white batch, scraping a vanilla bean into the chocolate, and adding a bit of vanilla extract for good measure. And I gave the pink cereal some love too, coating it with Valentine’s sprinkles. 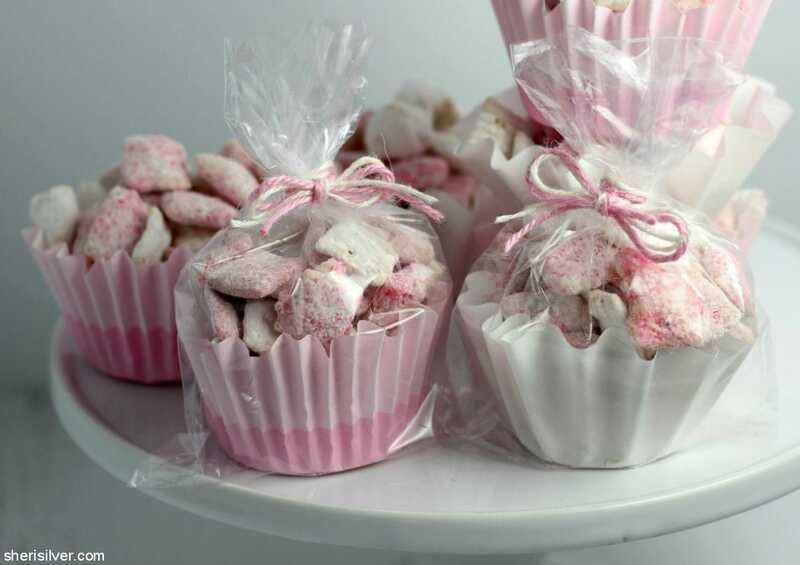 Pretty, easy, perfect for treat bags, parties and classroom celebrations! 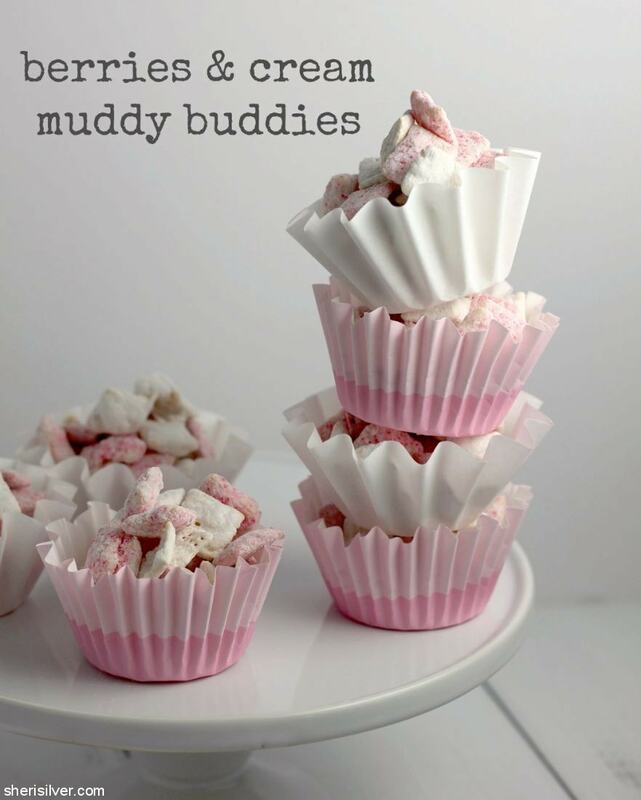 Make the Vanilla Muddy Buddies: Place the confectioner’s sugar in a gallon-size ziploc bag. Using the blunt end of a small knife, scrape out the grains from both halves of the vanilla bean into a large heatproof bowl (take a look at the picture in this post if you need help visualizing). Add the vanilla extract and candy melts, and set over a pan of barely simmering water, stirring constantly till melted. Remove from heat and add the cereal, folding to thoroughly coat. Transfer to the ziploc bag, close and shake to coat evenly. Spread out on the baking sheet to set. Wash and dry the bowl. 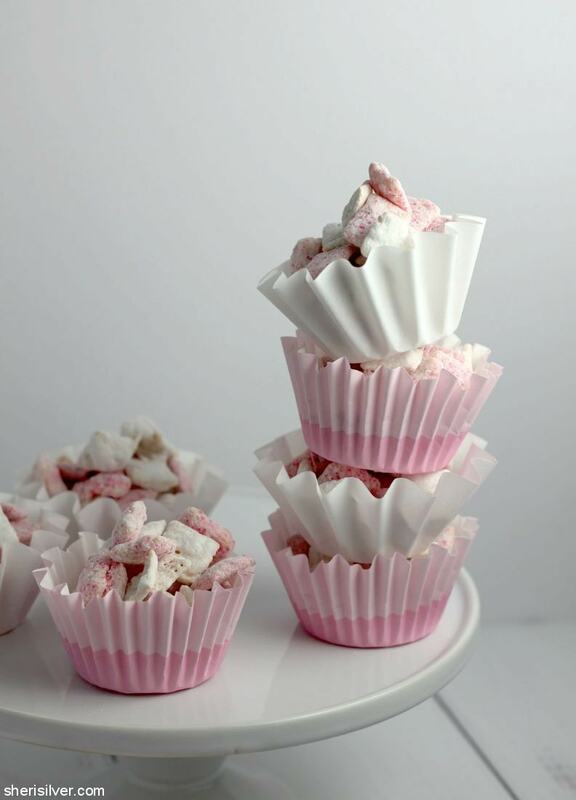 Make the Pink Muddy Buddies: Place the confectioner’s sugar and sprinkles or sugar in a gallon-size ziploc bag. Place the candy melts in your clean bowl and set over a pan of barely simmering water, stirring constantly till melted. Remove from heat and add the cereal, folding to thoroughly coat. Transfer to the ziploc bag, close and shake to coat evenly. Spread out on the baking sheet to set. Wash and dry the bowl. 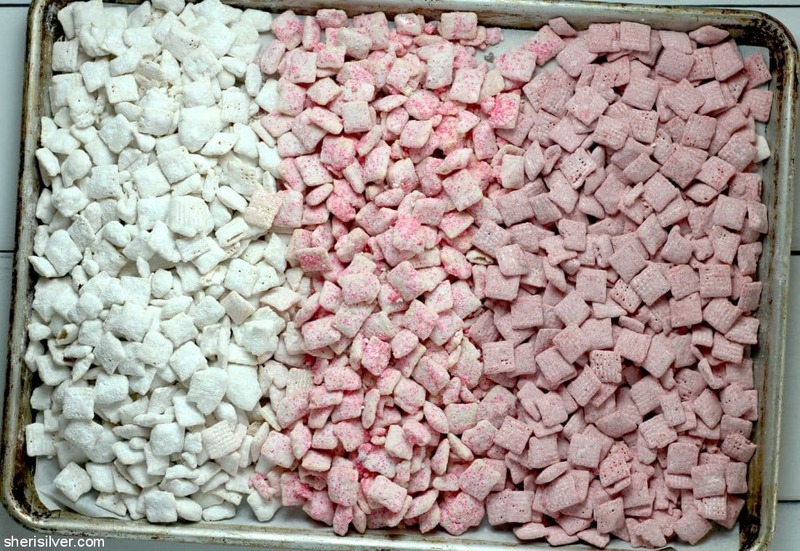 Make the Berry Muddy Buddies: Place the confectioner’s sugar and pulverized strawberries in a gallon-size ziploc bag. Place the candy melts in your clean bowl and set over a pan of barely simmering water, stirring constantly till melted. Remove from heat and add the cereal, folding to thoroughly coat. Transfer to the ziploc bag, close and shake to coat evenly. Spread out on the baking sheet to set. Mix the cereals together and store in an airtight container at room temperature. 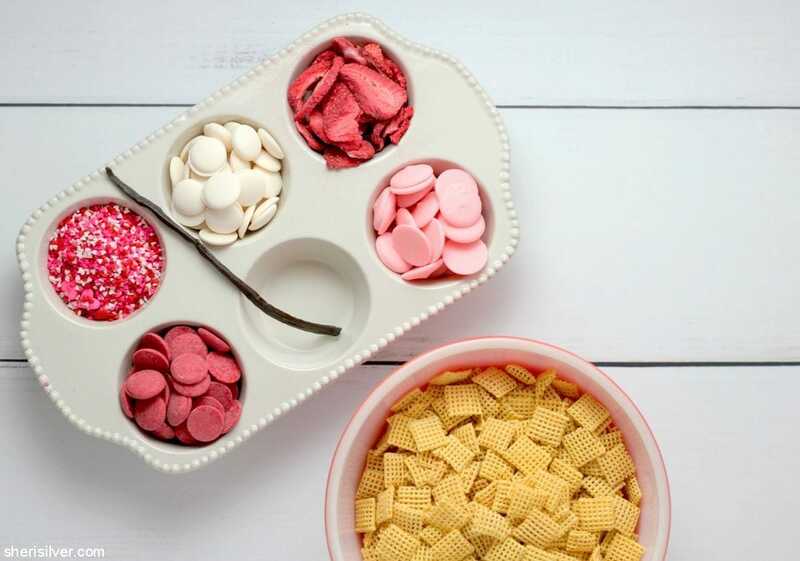 Want more Muddy Buddies, snacks, wheat-free treats and Valentine’s Day ideas? Head over to my Pinterest page!